The paper presents the results of comparative investigation of the interaction between the capillary and buoyant mechanisms of motion in a problem of surfactant mass transfer between an insoluble drop and surrounding fluid under different gravity conditions. The research was performed for the drop that is coupled with the reservoir filled with a source mixture through a long thin tube (needle). Visualization of the flow patterns and concentration fields has shown that surfactant diffusion from the needle at normal gravity leads to the onset of the oscillatory mode of the capillary convection in the drop. It has been found that the frequency of the Marangoni convection outbursts, the lifetime of the oscillatory flow modes and the amount of the source mixture involved in the process of mass transfer depend on the drop size and initial concentration of the surfactant. 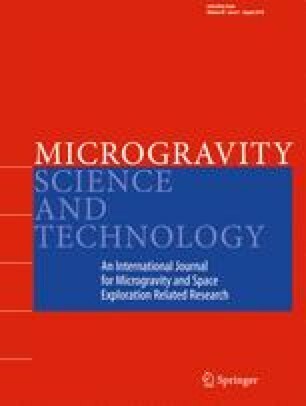 The obtained results are compared with the cases of surfactant diffusion from the isolated drop under terrestrial conditions and from the drop coupled with reservoir in microgravity. Additionally, a series of experiments were performed to investigate diffusion of a surfactant from the surrounding solution into a drop.